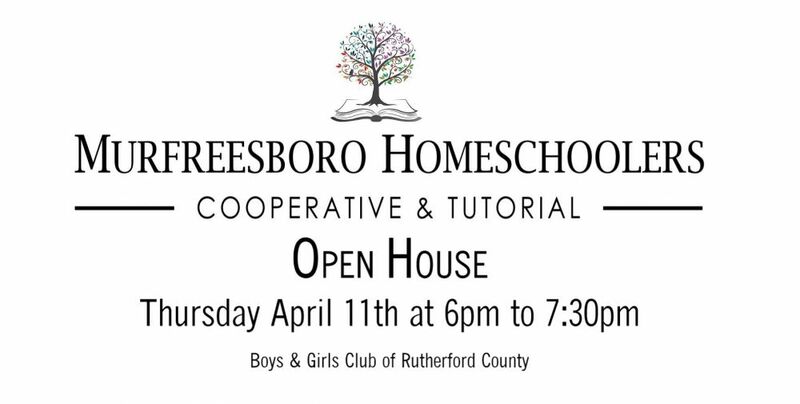 Come learn about all the wonderful things Murfreesboro Homeschoolers is offering in the 2019-2020 year! If you are interested in joining our organization or considering homeschooling we would love to share with you how MHS can help your family’s homeschooling journey. We offer tutorial classes for children in Pre-K through 12th grade, parent led educational clubs, community events, field trips and homeschooling support. As we gear up for our fifth year, there is lots of planning and organizing happening behind the scenes. Join us at the Boys & Girls Club of Rutherford County on April 11th from 6 to 7:30 PM for our annual Open House! Come meet many of our amazing tutors and leaders to ask questions about the classes and other opportunities at MHS. If you decide MHS is right for your family, we will have a registration table with members of leadership who can help walk you through the registration process and go over the welcome packet. We can't wait to share all the exciting opportunities we have for your children! Children are welcome and encouraged to attend this event. Please RSVP by signing up below!